Explore the Ship - Go Navy Go! While the flight deck certainly takes center stage on the HST, the array of support services on the ship is no less impressive. Jets are stored and maintained on the hangar deck, directly beneath the flight deck, an enormous expanse with room for 30 or more planes. Four huge transport elevators lift up to 100,000 pounds between the hangar deck and flight deck in less than 30 seconds. On-board air operations (right) is responsible for traffic control around the carrier – coordinating launches and landings, with up to 70 planes at a time on mission. 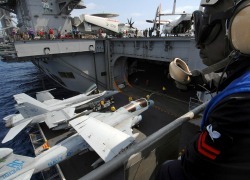 The ship’s Combat Direction Center (CDC) monitors all contacts – and possible threats – in the carrier’s vicinity. Delivery of ordnance (missiles, bombs and other things that go boom) to target is among the HST’s primary missions. 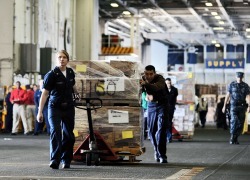 Ordnance worth almost $500 million is carried in 32 ordnance bays. The ship includes on-board machine, woodworking, and engine repair and maintenance shops. Of course a community of up to 6,000 personnel requires a full infrastructure including dining, sleeping, medical care, fitness center, chapel, waste and recycling and other facilities. Even the ship’s anchors require special facilities in the “foc’sle” (short for “forecastle”). Its two anchors are retooled from the retired WWII carrier USS Forrestal and weigh 30 tons each. The 1,000-foot anchor chain (from retired carrier USS Saratoga) has 684 links weighing 365 pounds each.